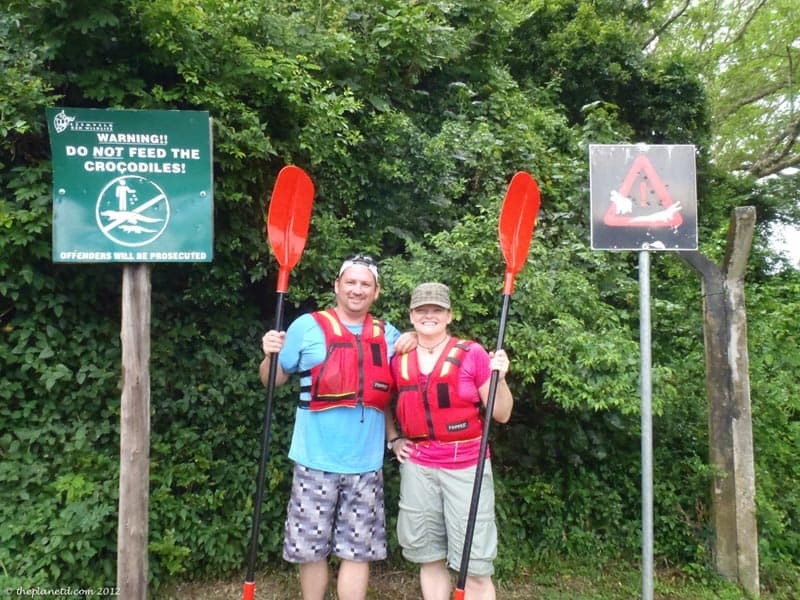 When South Africa tourism asked us if we'd like to go kayaking with crocodiles and hippos in St. Lucia, it sounded like a good idea at the time. We didn't really know what to expect, but hey, we love kayaking and it sounded cool. Once we got to the river to start our excursion, it was another story. I started to ask myself, why am I doing this again? We have paddled all over the world. We’ve had minke whales breach right behind us in Antarctica, we’ve seen vultures circle above us in Croatia and we've come face to face with moose in northern Canada. But there is something unsettling about kayaking in a body of water filled with man-eating predators who wouldn’t think twice about pulling you in. We knew that we were in for a different excursion than usual when our guide gave us a list of numbers to call in case anything should happen to him! In truth, crocodiles and hippos kill more people in Africa than anything else. What sort of person would think that it would be cool to kayak among them? Well, several people as a matter a fact. 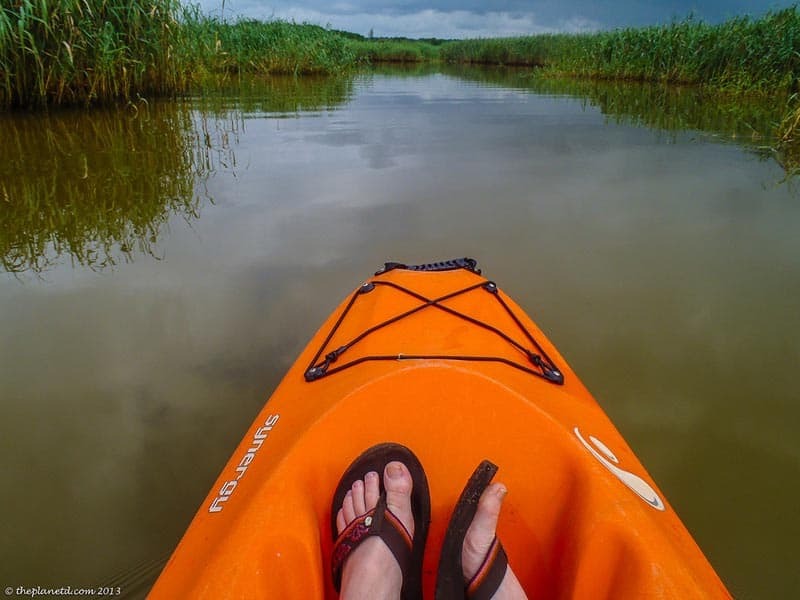 St. Lucia Kayak Safaris has a steady stream of thrill seekers entering the water each day in search of crocodiles, hippos and, oh, I forgot to mention, bull Sharks. The St. Lucia estuary is filled with man eating beasts who are just waiting for someone to fall in so they can have a feast. Okay, maybe they're not waiting, but with a body of water filled with 800 hippos, 1200 crocodiles and countless sharks of different species, I imagined them lurking under the water licking their chops. The day before we were told of a woman who was eaten by a crocodile last year while fishing. She had fished these waters all her life, but a croc finally got her. Years earlier, some crazy Australian woman decided to go for a swim in these parts…she never made it out alive. Nobody swims in these waters and only the truly insane kayak in them. 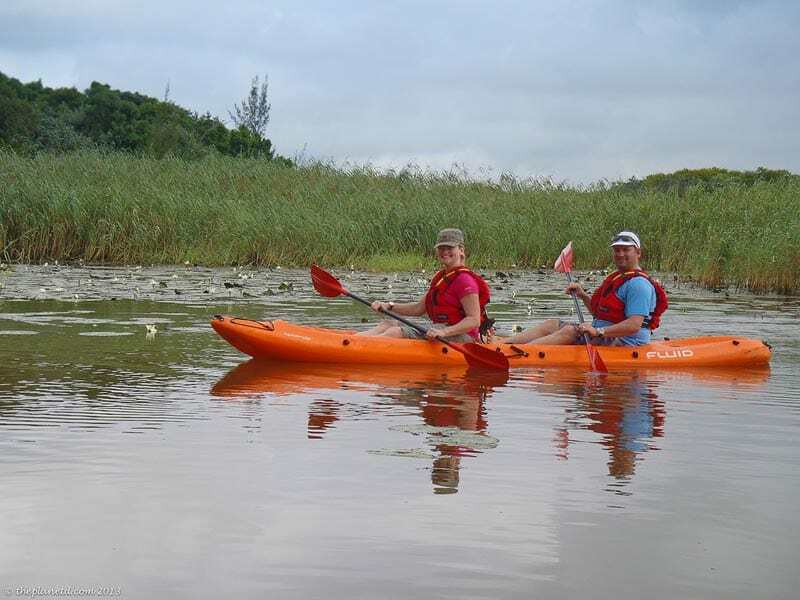 Mind you, talk to any local and it seems that everyone has kayaked the St. Lucia estuary. They seem so nonchalant about it, that it makes you feel weak when you worry about a silly little crocodile. If you like adrenaline and thrills, the sheer thought of getting into the water with wild crocodiles is exciting and that's why people do it. This isn't a controlled amusement park environment, this is untamed Africa and even if you don't have a hippo surface in right front of your boat or get too close to a crocodile, your heart will be pounding just by the sheer thought that they are under the water. As we launched our boats into the river, our guide told us to be very careful. “This is the most vulnerable location of the entire safari. 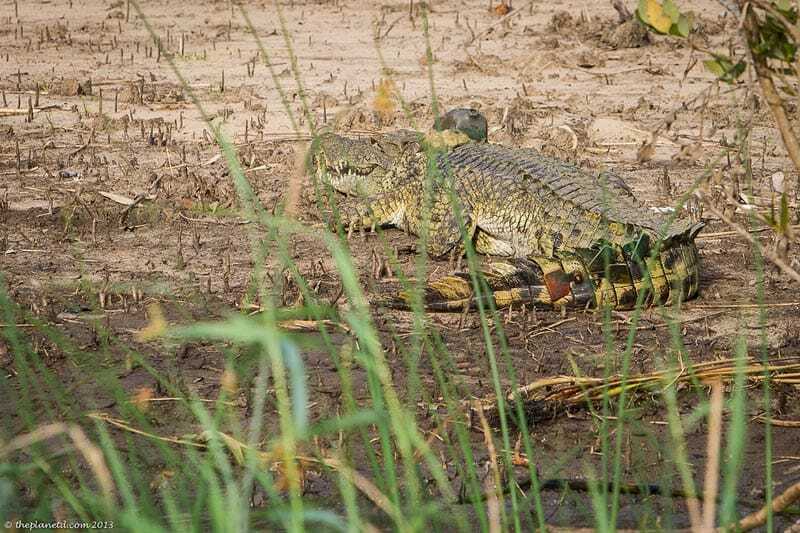 Stay alert and do not turn your back away from the water or put even a toe in it.” Crocodiles attack in shallow water and because people launch regularly from here, they know where the food is. We got in unscathed. 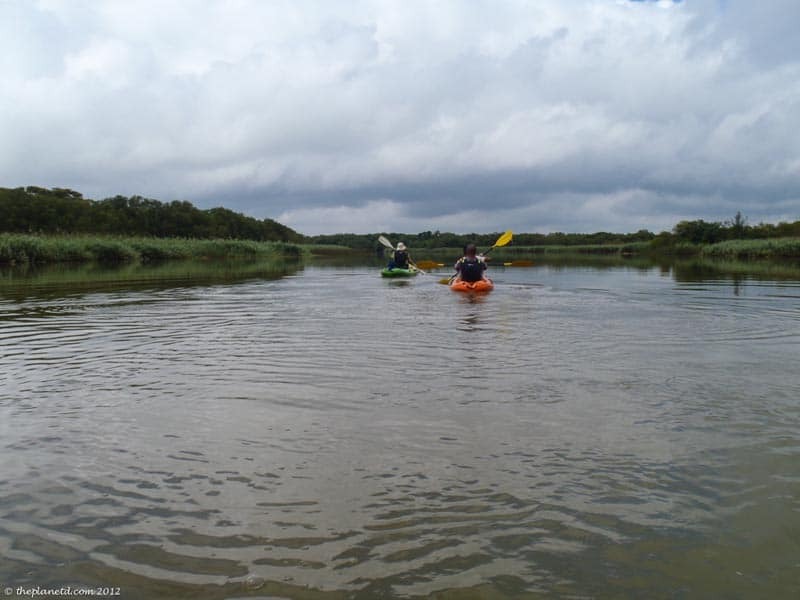 The creepy thing about paddling on this estuary is that the water is only an average of 1 metre (3.2 feet) deep. It’s murky and dark and you just know that scary things are lurking below. The first and only rule when paddling was to never put your hands or feet in the water. Unfortunately for us, we were on a trip with two guys who had never paddled before. 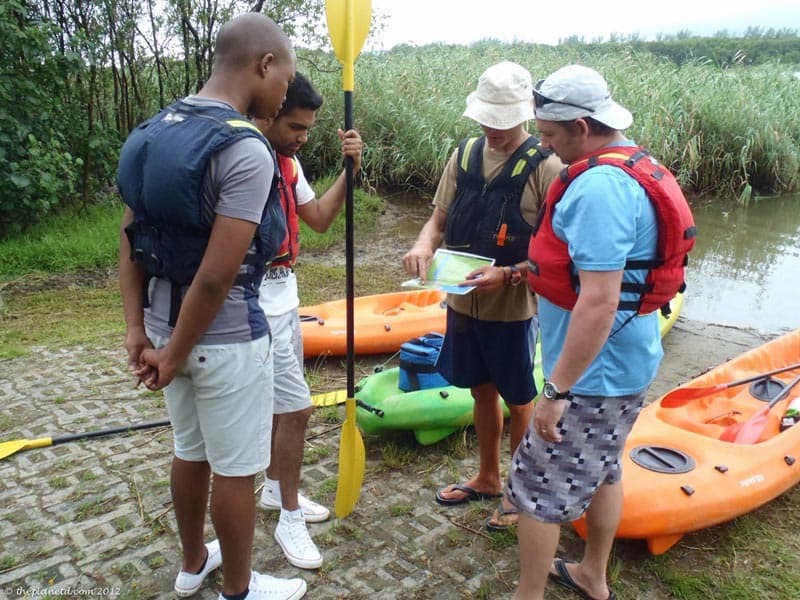 We found it surprising that two people would sign up for a paddling adventure in hippo and croc infested waters who didn’t know how to handle a kayak. They zig zagged all around, lost control and looked like they were about to tip at any moment. We kept our distance so that they couldn’t hit us or knock us over, but it was disconcerting to have to keep an eye out for the runaway paddlers. I’m all for giving beginners a chance, but not in this situation. I think you should have control of your boat if you are in dangerous waters. I’m not exaggerating when I say it could be a sticky situation. If you fall in, you’re bait for a crocodile, hippo or the hungry bull shark. We didn’t have the chance to cover a lot of ground and unfortunately the rain had started so most of the animals were dipping under the water to stay warm. 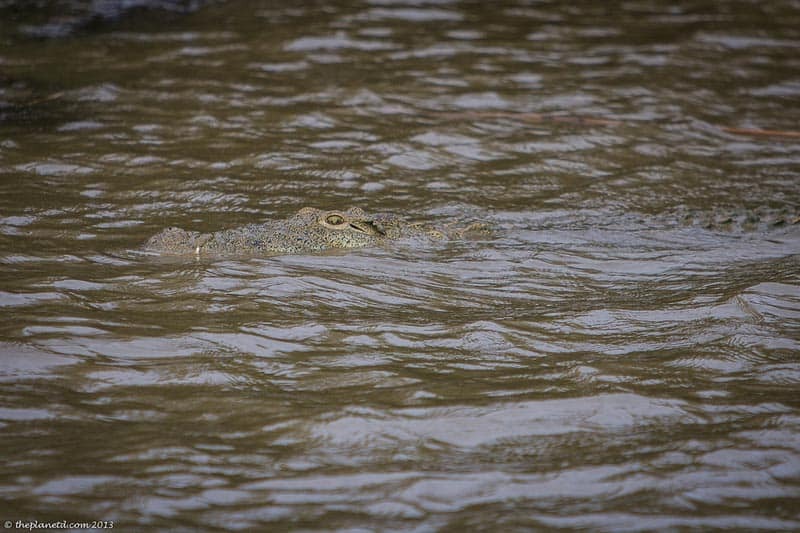 We’d see crocodiles in the distance, but every time we came close, they’d dip under the water. Eventually we didn’t see a croc at all so we made our way to the hippos. Hippos are fierce and scarier than crocodiles. The rule for paddling with hippos is to keep at least 30 metres (90 feet) away. That was fine by me! As we approached they made noise and seemed to either be warning us to get back or warning others to take notice. Hippos can move fast and if threatened they will charge. Their mouths are huge, so I had no intention of getting too close. While paddling it is important to keep an eye out for everything. Our guide and the owner of our hotel both told us stories of hippos surfacing right in front of their kayaks. Keep an eye out for bubbles and if one does surface, calmly paddle backwards as fast as you can. We felt confident if anything should happen. However, I kept wondering what would happen to our paddling companions if they encountered one. There was no way they would be able to paddle backwards. 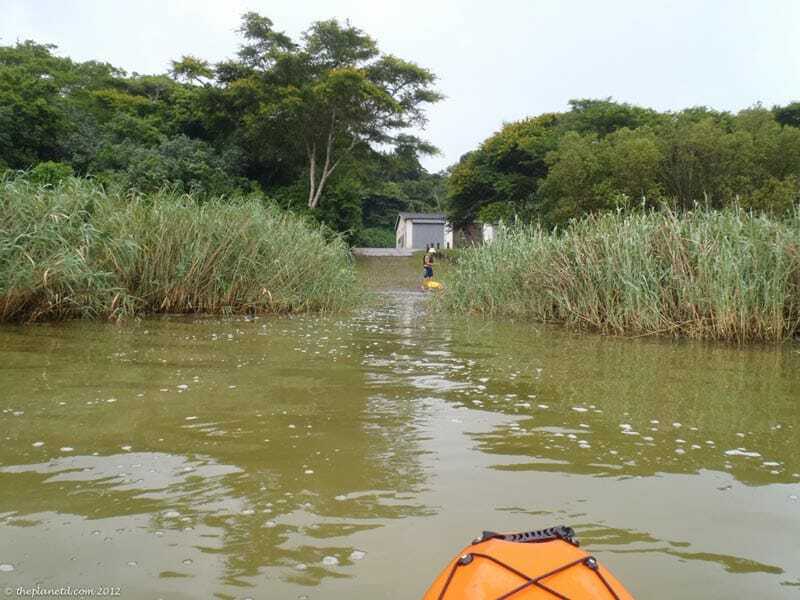 As the day went on, and once I was over the initial fear of being in the water with crocodiles and hippos, it felt like any other kayaking excursion. The wetlands are filled with birds. As a matter a fact, you'll find more bird here than all of Africa. 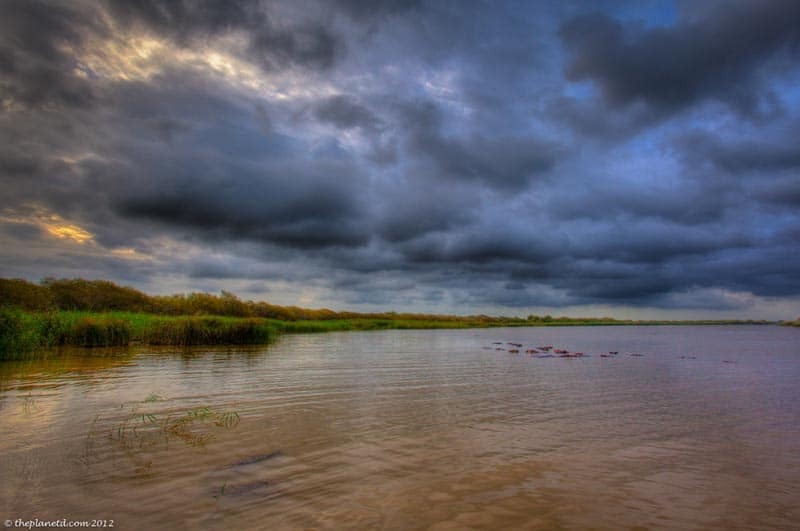 The iSimangaliso wetlands weren't names South Africa's first World Heritage site for nothing! 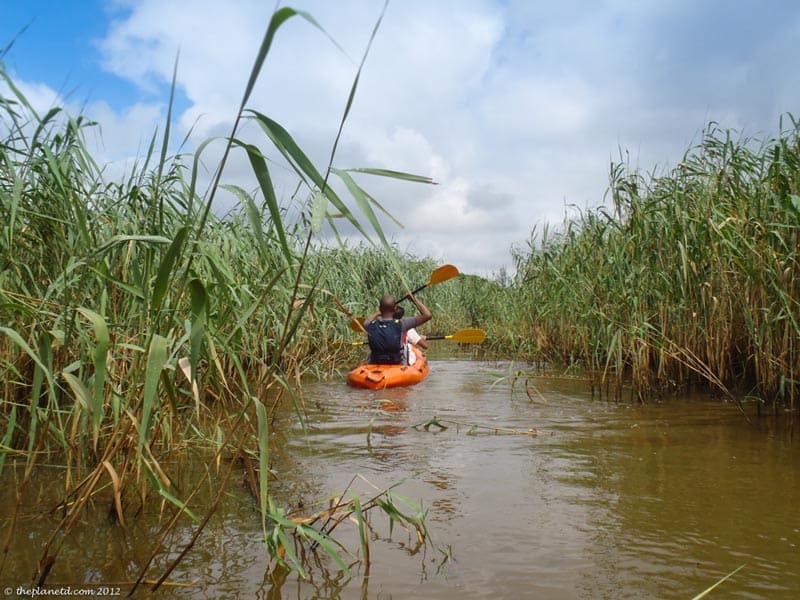 It's the largest estuarian system in all of Africa and connects eight different eco-systems making it a perfect environment to go on a paddling adventure. 17 Responses to "Kayaking, Hippos and Crocs, Oh My!" So, hippos are my favorite animal…it’s a weird story, but they have been since I was young. Seeing one in Africa is high up on my list and this sounds amazing! Crazy, but amazing. I love that hippos are your favourite animal. That is a first for us though, I don’t think I’ve ever heard anyone say that they love hippos. They are cute from a distance though aren’t they. You would love visiting this region then. 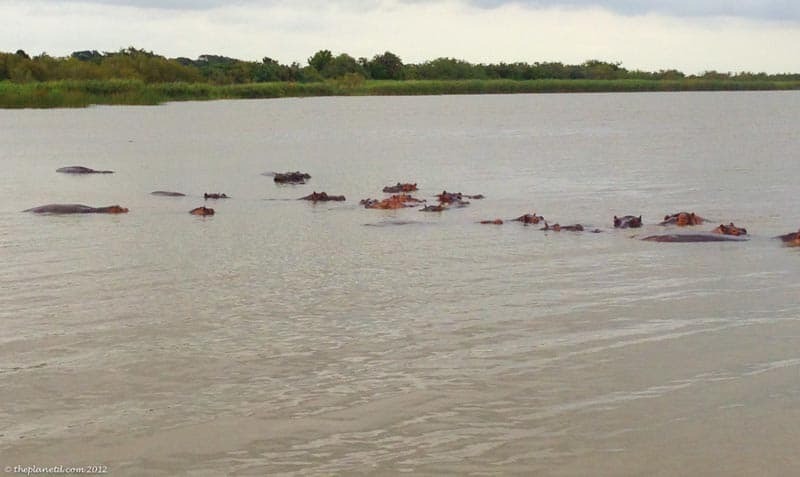 We’ve been to about a dozen countries in AFrica and here in the wetlands has been where we’ve seen the most hippos all together. Definitely worth a visit. You can do a boat tour too that takes you much closer to them. Excellent enjoy. We always root for the underdog. We like the Warthog. Not everyone’s favourite animal, but they are so ugly they’re cute! That sounds like a real adventure. I haven’t been kayaking in years, definitely don’t think I’d be up for kayaking with hippos and crocodiles. Awesome guys! We didn’t do the kayaking tour when we were in St. Lucia, it seemed a bit insane to me to get into the water with Africa’s most dangerous creatures…but it sounds like it was really thrilling and perhaps we missed out. We drove through the parks around St. Lucia ourselves on safari which was amazing. Such a great area, eh?! Haha, it does seem a little insane doesn’t it? But once you settle in, it’s just like any kayaking excursion, only your heart is pounding a little faster throughout. St. Lucia is an amazing area. We only had 3 nights there, but definitely could have spent at least a week exploring. Those guys are crazy!! I have never Kayaked before and I will Never have my first time kayaking in a dangerous location. I’m shocked they were allowed to go out there. I agree they were nuts. They told our guide that they had kayaked before, but it was very clear once they got in the water, that they had no idea what they were doing. Our guide was very patient with them. I think, once we were all in, there was really no going back, so he made the best of it. But true, I can’t understand why someone thinks it would be ok to kayak in these conditions for the first time.